※SHOCKPROOF AND LIGHTWEIGHT: The hiking poles adopts the high quality durable aviation series aluminum and lightweight about 0.7 lb/11.57oz, the shock effect is strong for hiking sticks, reduce the damage caused by the impact especially use these hiking poles for walking downhill. 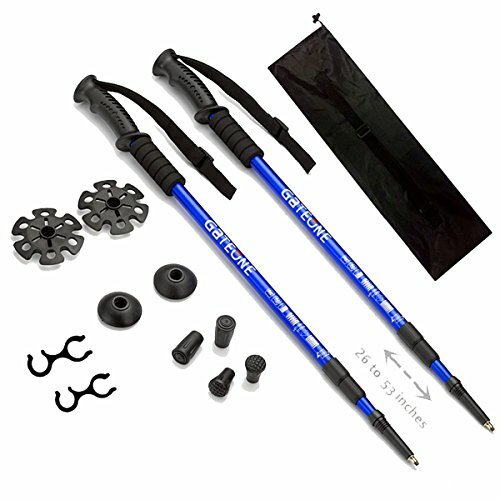 ※SOFT SURFACE AND ROTATION LOCK：The super steel alloy anti-wear poles traction tips for hiking sticks,a soft comfortable foam treatment for the auxiliar grip,also absorb moisture sweaty hands when use these trekking poles.Each section of walking poles is a rotating locking structure, easy rotation to locked at the appropriate height from everybody. ※RETRACTABLE LENGTH AND EASY LOCK: the trekking poles allow to adjustable length from 26 to 53 inches，easy to telescoping folding or collapsible, small size, light weight,these hiking sticks can be retractable stored in the backpack. ※EASY ADJUSTABLE WRIST STRAPS: the wrist straps prevent hiking sticks down from hand. The ergonomically engineered plastic grip of trekking poles provides with the maximum anti-skid, comfortable, natural and warm hand. ※100% REFUND - no risk to purchase. Click to add the hiking sticks to cart to experience a new life and fit. Remind: if the walking poles can\'t lock or broken, please contact us for replacement, we can provide the best service for you, Thank you!